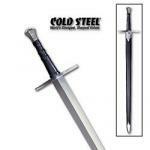 If you think that your only choice of authentic medieval weaponry is a decision between a cheap reproduction and an expensive antique, you haven’t seen any of Cold Steel’s work. 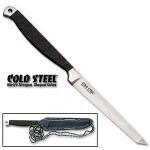 Cold Steel takes the old ideas and translates them into rugged examples of modern technology. Cold Steel does not claim to reproduce old techniques — instead the company applies today’s methods and materials to these useful old patterns. 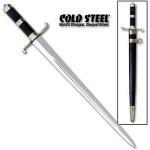 Many of Cold Steel’s ideas are unusual, and their pieces have value as collector’s items as well as applications in modern martial arts. 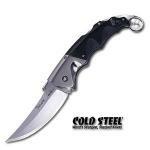 Since 1980 Cold Steel has pursued the goal of making the world’s strongest and sharpest knives. Along the way the company has introduced some surprising old ideas to the modern world, as well as engineering some respectable new technology. Their San Mai III steel brings samurai concepts of laminated shock-resistant blades to new versions of sporting and survival knives. 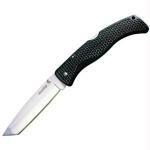 Not too many years ago, seeing a tanto point on an American knife was unusual — thanks to Cold Steel, we now see that option in many blades designed for extreme conditions. 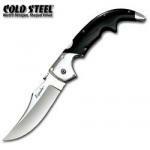 Cold Steel thought that a blade made to penetrate armor might also be handy in a car wreck, and many people now agree. 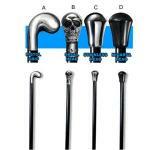 Products now range from carbon fiber walking sticks with the action of a good fencing foil, to totally functional hunting spears. You can tell that the people who work at Cold Steel enjoy what they do, because there’s a library of company videos showing company executives trying out nearly everything they make. 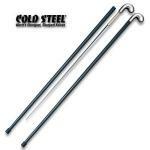 From pork to plastic tubing, if it’s at Cold Steel it’s probably destined to become part of a product test. 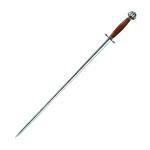 Their modern medieval weapons surpass the quality of old weapons in many ways, and in appearance vary only slightly from the traditional patterns. 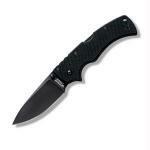 Cold Steel also makes a variety of self defense tools, and folding knives for sporting use and everyday carry. 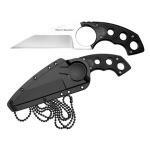 Not everything made by Cold Steel would be appropriate for civilian use, but among the swords and spears and self-defense items you’ll find plenty of sturdy and completely useful everyday blades. If an interest in martial arts brought you to Cold Steel, consider taking part in their Cold Steel Challenge — a combat competition using non-lethal weaponry and plenty of protective gear. 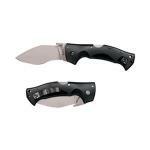 The True Flight Thrower from Cold Steel combines common sense materials and good design. 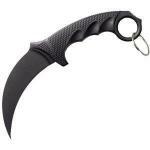 This balanced throwing knife also cuts and could be a good survival knife choice. 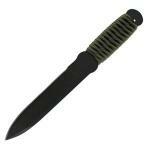 Here's a throwing knife that doesn't skimp on quality. Cold Steel's Perfect Balance Thrower has enough weight for a satisfying hit and construction tough enough to withstand the battering any throwing knife takes. 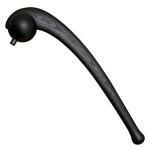 The Cold Steel Spike Tomahawk brings back an old frontier style that was more fighting tomahawk than camp axe. 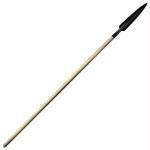 The spiked poll of the axe is obviously dangerous, so if you're going to use this one in the woods, be careful. The backswing gets a little hazardous. 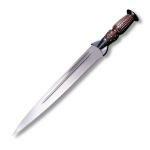 The favorite field and military knife of Nepal's Gurkha regiments inspired the Rajah III from Cold Steel. Recreating the broad and heavy blade of a kukri knife in a folding clip knife style is right in line with Cold Steel's philosophy. 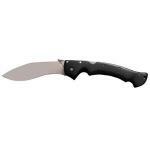 Cold Steel's Trench Hawk brings convenient technical improvements to an already popular tactical tomahawk design. 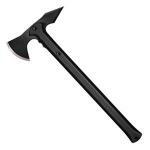 Changes make this an excellent axe for throwing, as well as for ordinary camp work. 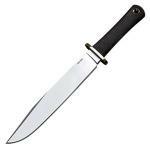 The Cold Steel Trail Master isn't just a knife with a Bowie-style blade. 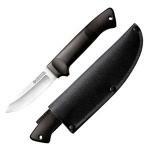 The Trail Master is a genuine Bowie knife in the old sense, but built with modern materials and to modern standards. 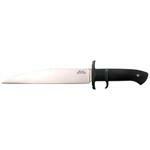 Cold Steel -- well known for its functional replica weapons and self defense knives -- also produces a series of Kitchen Classics knives. This set of six steak knives shows the functional concepts we expect from Cold Steel, but the look is better suited to prep. 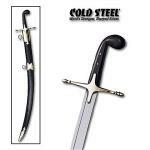 Inspired by authentic museum pieces and by dress swords still carried by the British Army's Royal Regiment of Scotland, Cold Steel's Scottish Broad Sword demonstrates there's more to this company's self defense swords than good looks. Built for actual cutting practice, the Cold Steel Shamshir matches the old Ottoman shamsir pattern so well that it's a fine addition to any weapons collection. 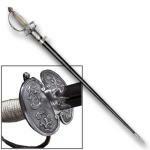 A few modifications fit the Cold Steel Shamshir to modern uses, but the essence of the sword is unchanged. 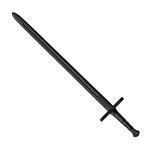 Many of Cold Steel's better swords, like this Hand-and-a-Half Sword in black leather and steel, have the look and feel of good tools. 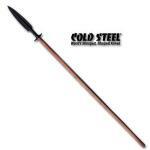 Remaking old designs with new processes and materials, Cold Steel creates traditional weapons which aren't traditional. They just work. 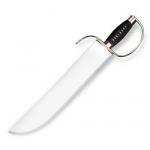 Swing Cold Steel's Gim Sword with confidence. 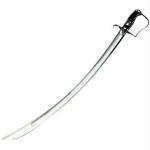 Patterned after a popular style of martial sword from China, the Gim Sword uses high quality materials and solid construction techniques. 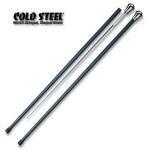 Cold Steel's testing methods prove it holds up in rough use. Cold Steel jumped into the artistic pool with knives like the Talwar Folder, built in cooperation with designer Lynn Thompson. Called a pocket sword rather than a pocket knife, the Talwar combines the style of old Spanish weaponry with the usual invulnerable mechanics of Cold Steel products. 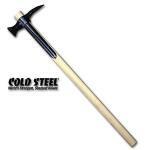 Cold Steel's Boar Spear, based on a medieval European hunting design, combines a lightweight medium carbon steel spearhead with a stout American ash shaft to create what Cold Steel intends to be a throwing weapon.